Thomas Edison holds over a thousand patents in his name, including the electric light bulb, the phonograph, and motion picture camera. He is considered among the world's most prolific inventors, with a work ethic and vision for the future that helped change the modern world. And with all of the advances in current technology that he helped to invent, just imagine: What Would Thomas Edison Be Doing Today? 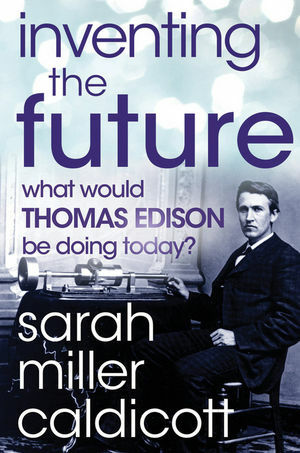 Author Sarah Miller Caldicott, a great-grandniece of Edison and expert in his methods, sets out to answer just that. Inventing the Future is a well-researched, intriguing look at how Edison would innovate today using new technology, and how modern day thinkers can adapt his proven innovation methods to their advantage. It also includes 7 steps anyone can take to start thinking like an innovator, and offers a hands-on view of how creativity and risk-taking come together to design powerful concepts that create new markets. Learn the strategies needed to remove innovation barriers, begin driving the breakthroughs of the future, and change the way you do business. Stimulate your ability to imagine what's possible. Sarah Miller Caldicott (Oak Park, IL) is the great grandniece of Thomas Edison. Co-author of a groundbreaking book on Thomas Edison's innovation best practices, entitled Innovate Like Edison: The Success System of America's Greatest Inventor, Sarah speaks to audiences across the country, and leads executive seminars on how to embed Edison's Five Competencies of Innovation in their organizations. These competencies propelled Edison to generate a record-breaking 1,093 US patents and 1,293 international patents over 62 successive years. Sarah also shares with leaders how they can use Edison’s time-tested methods to create innovation literacy in their organizations, as well as develop corporate innovation infrastructure to propel them toward innovation success. She advises executives and business owners on how to design teams for maximum innovation impact, "re-wire" their cultures to create a 21st century innovation powerhouse, and hire collaborative employees that will thrive in an innovation-driven culture.